ASE KR's SiPs incorporate the most advanced assembly process and design for recent cost / performance applications. This advanced IC package technology allows application and design while maximizing the RF performance characteristics. 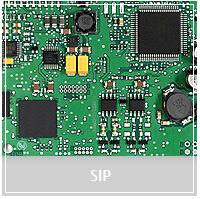 ASE KR's SiPs feature two or more active dies (Silicon, SiGe and GaAs) and their associated 50 ohm matching network. ASE KR's SiPs are designed for low inductance, enhanced SMT ability and Custom designs with higher performance along with long-term reliable operation.